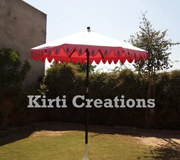 Umbrella Tents are stitched perfectly with fine fabric and metal ribs which can be used for long time. The range of Umbrella Tents offered by us is made available in different designs, sizes, capacities and colours to suit the varied preferences of our clients. These tents manufactured with premium quality materials that have a perfect finish, stylish appearance and light in weight and are made in compliance with the international quality standards. This Outdoor Umbrella Tent with its beautiful design is best suited for enjoyment in gardens and lawns. Outdoor Umbrella Tent is made with good quality fabric due to which it gives a complete protection against the harmful effects of sunrays.